On 22nd December 2013, Mike Clayton, BCRC Equipment Officer and MCRO Secretary ran another equipment inspection course, this time for our colleagues of the Severn Area Rescue Association (SARA) at Tewkesbury. Over £130 was raised at this year's SCMC annual dinner when past and present members took part in a "sealed envelope" raffle. A big "thank you" to everyone who took part - and commiserations to all those who found that their envelopes were empty! For cavers, the national caving conference, Hidden Earth is a social highlight of the year with an inspiring programme packed with lectures, presentations, competitions and socialising. This conference, the British Cave Rescue Council (BCRC) gave a presentation with MCRO member, Dave Bowdley, thought provokingly talking about his own cave rescue from many years ago. This was followed up by MCRO member, Emma Porter talking about the work that two MCRO members started in Tunisia, which has become a BCRC project, in supporting and training cave rescuers in Tunisia. Thanks to two MCRO members, Mike Clayton and Deanne Wilkins who worked on the Technical Team at Hidden Earth and assisted this presentation. A change of venue this year, saw the Emergency Services Shows at the NEC, which is the the UK’s leading annual event for all emergency responders and personnel. 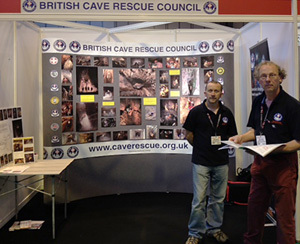 The British Cave Rescue Council (BCRC) had a stand in the UK SAR section of the Show, together with other voluntary rescue organisations. The BCRC stand was supported and visited by members of MCRO during the two days. MCRO Secretary Mike Clayton and GCRG Chair Paul Taylor looking after the BCRC stand. Rather than just practising rescue, this weekend was planned as a social and to just go underground together. MCRO members from Cave & Crag, Dudley Caving Club and Shropshire Mining & Caving Club had an enjoyable weekend in Croesor-Rhosydd and Cwmorthin Mines. Following on from our successful days at GO Outdoors Coventry and Erdington, we were invited to look after the climbing wall at the newly opened Go Outdoors in Kidderminster and to promote mountain and cave rescue. On a nice sunny day several members attended Gloucester Cave Rescue Group’s training exercise at Wigpool Mine in the Forest of Dean. The morning session was given over to a series of hauling and rigging exercises. In the afternoon a surface search was organised by Severn Area Rescue Association (SARA) to build upon our January training. A very worth while day. At the 2013 British Cave Rescue Council AGM, Anthony Rich, received from BCRC Chairman, Bill Whitehouse, a long-service certificate for 20 years of voluntary work as Legal Advisor to BCRC. Several team members were able to attend the British Cave Rescue Council Technical Training day at Buxton Fire Station. Where representatives of cave rescue teams from around the country were able to demonstrate new techniques and swap ideas. MCRO's Diving Officer, Rick Stanton, has been made a Member of the Order of the British Empire (MBE) in the Queen's 2012 New Years' honours list. Rick received the honour in recognition of his service to the communities of the West Midlands as a firefighter, and for the cave diving rescue services he carries out on a voluntary basis both in the UK and abroad. This award follows his Royal Humane Society Bronze medal award in August 2012 for his dive rescue work in France in 2010. 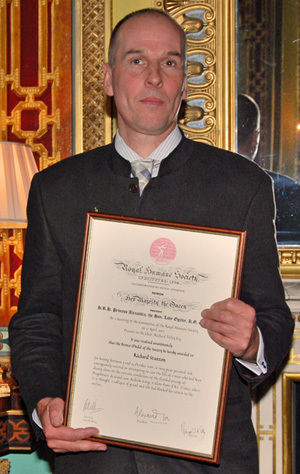 Rick Stanton with his Royal Humane Society award in 2012.